Posh centre-back Gaby Zakuani could well be rested from the game at Millwall. 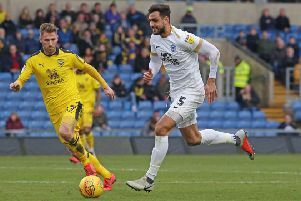 Scoring first could be the key to a Peterborough United victory in their League One fixture at Millwall tomorrow (February 20). Posh have won just once all season after conceding the first goal in a game and that was back on August 15 when they defeated Colchester 2-1 at the ABAX Stadium. And no match at the New Den this season has been won by a team who let in the first goal. Indeed Posh will look to take advantage of Millwall’s vulnerability at home. Their 2-0 defeat by Scunthorpe at the New Den on Tuesday (February 16) - a match watched by Posh management team Graham Westley and Grant McCann - was a seventh home reverse of the campaign for the team currently sitting in sixth place. Posh lost for the fifth time at home last Saturday (February 13) when they were thumped 4-0 by Bradford City, but Westley is certain the visiting supporters will see a much-improved display tomorrow. “Anyone who knows anything about football will know that last Saturday was always going to be tough because of the week we had endured,” Westley stated. “But, as you’d expect, we’ve had a much lighter week leading up this game and a lot of the brightness has returned. They players have been recovering well and we should be going into the Millwall match on more of a level playing field and if that’s the case we will have a very good chance of getting a positive result. “I will be reminding the players how good they were in two FA Cup ties against West Brom. That sort of form should give a team massive confidence when returning to League One football. “Like most teams in the division, our best form arrived when we were virtually putting the same team out every week. It’s been difficult to do that lately. Defenders Ricardo Santos and Harry Toffolo plus midfielder Erhun Oztumer could all be re-called to the starting line-up after missing the Bradford City defeat. Centre-back Gaby Zakuani and Andrew Fox are among those expected to stand down. Millwall manager Neil Harris admits his side have to improve their home form if they are to maintain their promotion challenge. The defeat against Scunthorpe followed a run of five wins and a draw in League One matches. Harris said: “Tomorrow is an opportunity for us to find that magic formula for playing at home. We need to find it quickly. We didn’t seem to have it at the start of the season, but we did leading up to Christmas. It now seems to have deserted us again. “Scoring at vital times gives you that belief and a foothold in the game. “We want players to express themselves, play with some freedom and try to do what is asked of them.